I have now been living on and off in London for 12 years. Just like the amazing Konstantin Binder I consider myself a fan of the place (though I lack his stamina, encyclopaedic knowledge and gift for the narrative) and have been around its quite a few numerous microcosms. Actually. let’s talk about these microcosms for a second: have you ever noticed how each and every tube station that you enter seems to propel you into a different world? There is not one stairwell of the London Metro that delivers you into an area that in the slightest bit resembles the station previous. Each and everyone seem to completely inhabit a different plane of existence, not in anyway connected to the other stations in the vicinity. Only if you actually take a small car and drive from east to west at 5am in the morning on a spring day you start to realise how these dots on the map are connected. I haven’t attempted this yet from north to south, as this would mean venturing south of the river, but I am sure one day this can be achieved as well. 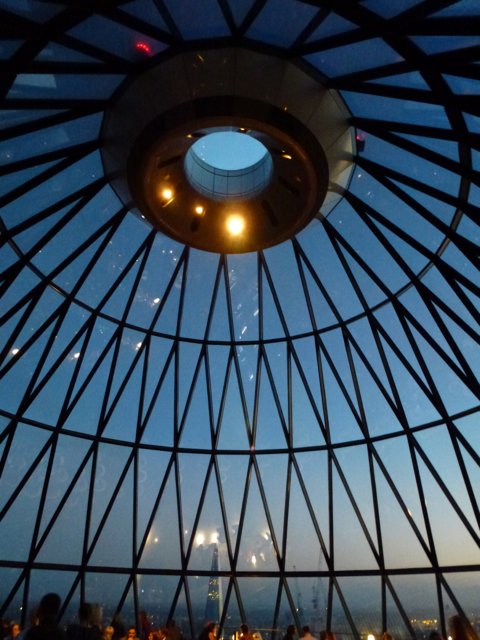 Anyway, back to the Gherkin. Has there ever been a building that looks more like a mechanised pleasure item for the female nether-regions like Sir Norman Foster’s phenomenal phallic frolic for posh office workers? While I personally think that the building is more a object of ridicule than architecture (although it’s apparently highly ecologically worthy), I’ve never entered it. Until recently. Searcys (a posh caterer) opened a private club/restaurant on its tip, and it’s a bloody revelation. 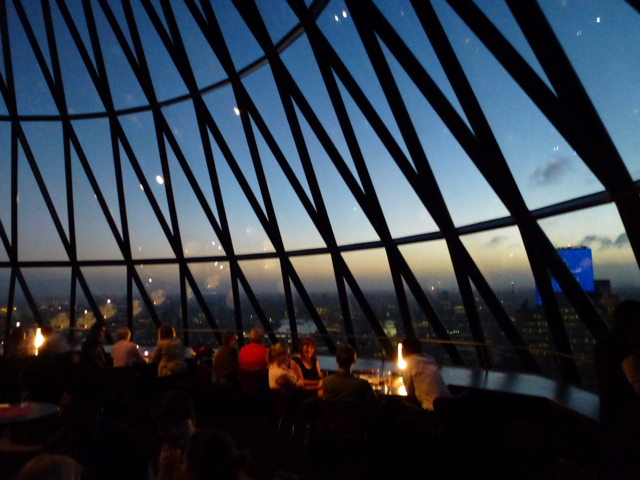 Apart from the stunning views the architecture offers, the food is impressive, the service immaculate (once they get going), the wine list a revelation and the whole experience worth every penny. Good work Searcys.